How to Get an Editorial Internship? If you want to work in a publishing house in the future or if it’s your dream to become a successful editor, then make sure to get an editorial internship. Not only will you learn a lot about editing here but also increase your chances of nailing a good job in the future. The process of finding an editorial internship is not simple but isn’t impossible either. You can get it done if you follow all the suggestions enlisted in this article. So keep reading to learn more. The first thing you need to do is search for all the internships you want. There are several websites these days that are willing to offer jobs and paid internships to young professionals. Bookjobs and mediabistro are some popular websites you could try. Some of the links are outdated so search thoroughly on Google before you find the best. You should apply to all of the places and inquire to them about a couple of things if you like. Many companies are willing to provide stipends for your living and expenses. So check them out too. A second thing that can help you is putting everything you have on your resume. Also writing good cover letters would help. When preparing a resume and cover letters, you should be very careful. Here you need to prove your passion and how keen you are on doing this internship. Speak about your skills and all the relevant experiences you have had so far. Your experience could be anything… even running a bookshop or writing for blogs online is good. Mention your writing skills as well. So when you have received an invitation to go and attend the interview, you have just one option left… to prepare yourself so well that they are bound to take you. Be well dressed and try your best to look confident. You should get ready from the night before if you want to ace this. Research the company online and get to know about the organization as fast as you can. Think of tough questions and prepare answers for them. Once the interview is done, send them thank you emails. That sends off a good vibe. If you have been writing for blogs or in case if you have a blog of your own, make sure to mention that on the resume too. Also be ready to speak about it if you are called for the interview. Plus if you haven’t started writing already, then it’s high time you should. This will make a very good impression of you. Some of you who wannabe editors must have tried your luck at writing novels, scripts and stories… mention that as well. Who knows they might like them and select you right away? You don’t have to be a major in English or get some certificated course in creative writing in order to excel in something like this. Keep a track of the newsletters, industry blogs and other books if you want to. There are several books that release good stuff on a regular basis. Keep reading them if you want to keep learning and gather experience. You should write for your school and college newspapers if you want publishing houses to check out your CV. It is always a plus point to have good experience. You should follow agents, editors and literacy agencies along with publishing houses that you are keen on interning for. This includes blogs online as well as Twitter. Check the publisher’s website for even more opening if available. And after you have done all of that; you must learn to be patient. You never know when an internship will come your way. Make sure to tell all your friends and pals about it. In case they hear anything about it, they can inform you right away. Don’t miss out on such opportunities. Often good internships come from outside the city. So make sure your family is willing enough to send you elsewhere. You should also be financially stable enough to move to another location. So make sure you have saved enough money. Sometimes the best will not be available in your own location. It is best to consider moving to a different location when situations like this arise. So think about things like this before you actually think of an editorial internship. If you have not written a real resume or cover letter before, make sure to go to the career services office in order to enquire more. There are people and seniors who can help you out with things like these. Career services are quite a standard office and are found in most universities in days like these. They have always helped other people find publishing internships. So they can help you as well. Feel free to visit the one in your university if you want more help. One of the best places to look for editorial internship is by attending more job fairs. They are held a few times throughout the year. So keep a track of all of them and make it a point to attend these fairs. Here you will find several people who belong to the industry you are willing to get into. They can give you great career advice and help you find a good internship in the future. You can find a couple of good seniors as well who can advice you. They will let you know about the upcoming events so that you can attend them too. Plus you can collect their business cards and contact them later. 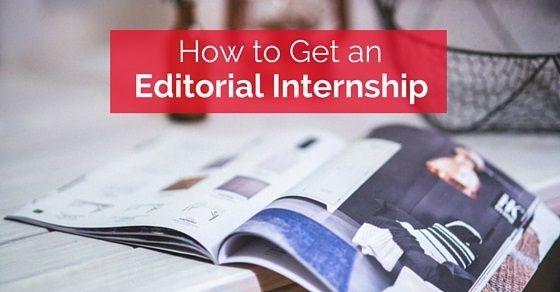 The following tips will help you ace an editorial internship. Keep a track of them and make sure to implement all. The key to doing well in an internship is asking several questions. It does sound simple but when you are inside the editorial office, asking questions will seem a little silly. But if you want to make most of the time you have, try to ask as many question as you can. This will help you learn more and utilize the time you have there. When you are writing a story, don’t be afraid to ask your editor a couple of questions. Most editors will appreciate this. But remember to ask important questions. Another thing you should remember to do is be observant and stay curious. You should keep a track of everything that a newspaper or magazine covers. See what is in trend and what do magazines these days focus on. Covering crucial events is important for you in an internship and this could help a lot. It is important for you to attend meetings if you like to ace a good editorial internship. Try to see what others are talking about. How do meetings go about and what kind of things are discussed… check them out and keep a track of them. This could help you a lot in the future. If you haven’t attended meetings before, tell your boss that you would like to, so that you can observe. So when you are doing an internship, do remember that you will make mistakes. And there has to be someone to correct them. So when your boss scolds you or a senior tells in front of everyone that you’ve gone wrong and you need to correct yourself… behave like a professional and learn how to handle the situation. This is also something you must do if you want to make use of the internship. Try to build as many relationships as you can and speak to all your seniors. This could help you build new connections and reach out to those who can help you in the future. Be of some use to another person so that they can give you bits of information. This brings us to the end of the post. Having an editorial internships are certainly helpful if you want to work in a publishing house… especially for newspapers and magazines. Fortunately this post has mentioned not just how to get an editorial internship but also ideas through which you can ace them. Make sure to take each of these steps carefully and we guarantee you will be able to make the best of it. And just in case you have a couple of questions regarding this post, feel free to comment below. We would love to hear from you!